GAZA CITY (Ma’an) — Six Palestinians were killed and 145 others injured as Israeli military forces opened fire at a demonstration by the border fence east of Gaza City and near Khan Younis on Friday, medics and the Ministry of Health said. The Gaza Ministry of Health said Shadi Hussam Dawla, 20, Ahmad al-Harbawi, 20, and Abed al-Wahidi, 20, were shot and killed east of the al-Shujaiyeh neighborhood. Muhammad al-Raqeb, 15, and Ziad Nabil Sharaf, 20, were killed after being shot by Israeli forces near Khan Younis while Adnan Moussa Abu Elayyan, 22, was shot in the head and killed in the same area. One hundred and forty-five other Palestinians were injured, according to a statement by the Ministry of Health, 10 of whom are in serious condition, spokesman for the Ministry of Health in Gaza Ashraf al-Qidra said. An Israeli army spokesperson told Ma’an that 200 Palestinians approached the security fence and hurled rocks and rolled burning tires at Israeli forces. Israeli forces responded with live fire towards the “main instigators,” she said, confirming five direct hits. The deaths in Gaza come amid renewed violence in the occupied West Bank and East Jerusalem on Friday. In the Israeli city of Dimona, an Israeli teenager stabbed four Palestinian Bedouins who worked for the local municipality, seriously injuring two. A Palestinian was shot and killed in the illegal settlement of Kiryat Arba after attempting to stab an Israeli border officer, police said, while a Palestinian woman was also shot in Afula after allegedly attempting to stab an Israeli security guard. 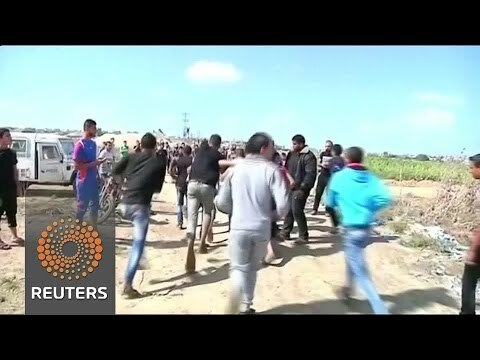 Video footage of the incident shows heavily armed Israeli forces open fire multiple times at her, despite her posing no threat to them. Tensions had been mounting steadily for weeks across the occupied Palestinian territory due to Israeli restrictions on Palestinians seeking to enter the Al-Aqsa Mosque compound in East Jerusalem. At least 900 Palestinians have been injured in seven consecutive days of demonstrations and clashes in the occupied West Bank and East Jerusalem, at least 60 with live fire, medics say.